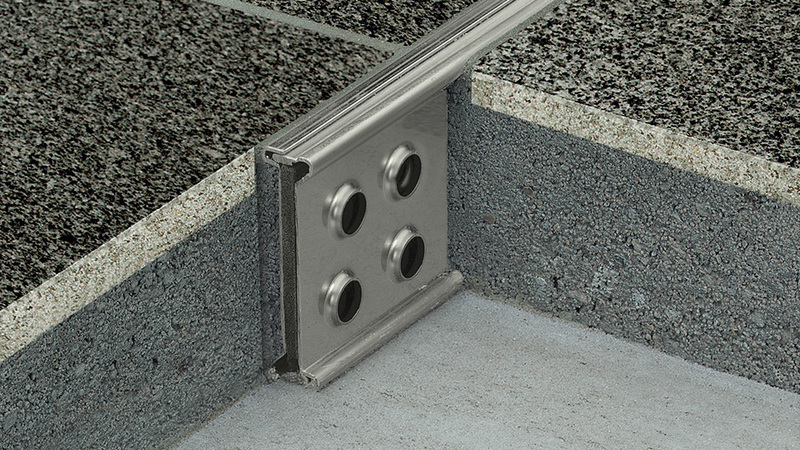 Movement joint profile for screed bed applications, in stainless steel. Features tongue and groove connections to accommodate horizontal movement. Movement joint profile for screed bed applications, in PVC. Features expansion zone of soft CPE and choice of extension profiles for supporting greater screed layer heights. Movement joint profile for screed bed applications, in PVC. Features expansion zone of soft PVC and serrated side walls. Movement joint profile for screed bed applications, in PVC. Features detachable tubes to accommodate the thickness of the mortar bed and tile or stone surface. Movement joint profile for installation in conjunction with floating or bonded screeds, in PVC. Connected at the top and bottom with soft CPE movement zones. Movement joint profile in PE foam. Installed at door areas or to divide screed into sections.